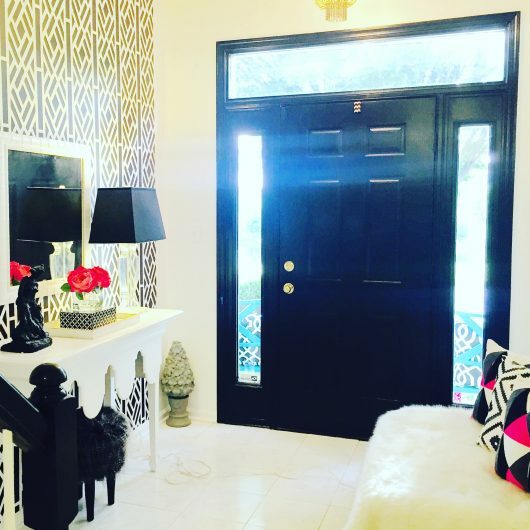 This entryway belongs to Sallie and after updating her kitchen, she felt her entryway could also use a patterned boost using stencils. 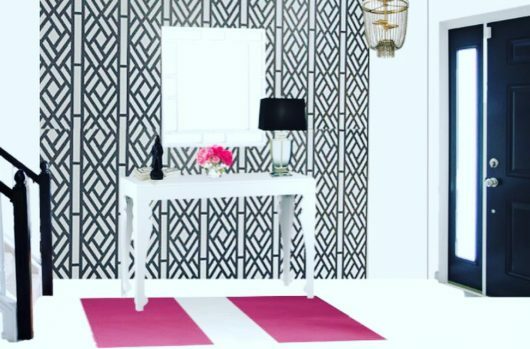 She put together a design board which included a geometric wall pattern and a bold color combination. While wallpaper can be a great way to add visual interest to a space, it’s expensive and a hassle to install. That’s why stencils are a great alternative. Wall stencils are an easy and inexpensive way to update a space. 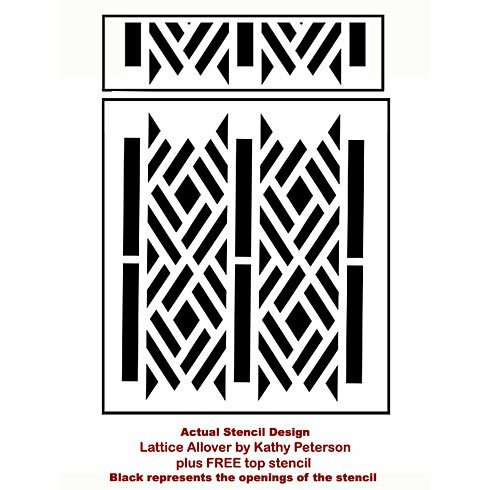 Sallie browsed our website and selected the Lattice Allover Stencil Pattern by Kathy Petereson. 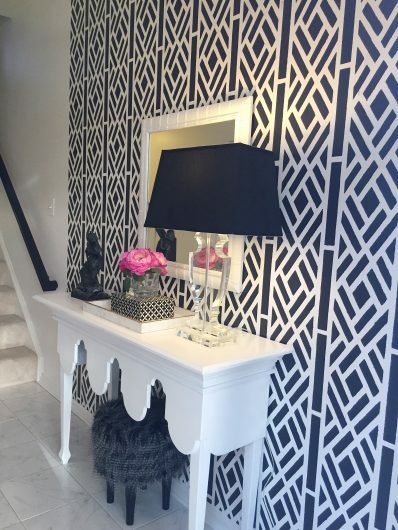 This geometric pattern is part of our designer stencil series and is perfect for enhancing a lackluster entryway. With her new stencil in hand, Sallie was ready to start her stenciling project! She hired Lynn from Plasters of Tuscany to paint the accent wall. 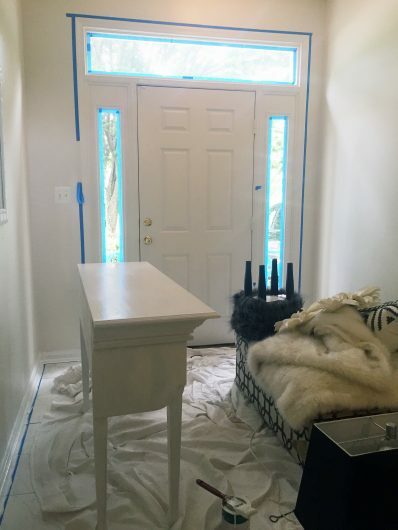 Lynn used blue painter’s tape to hold the geometric stencil in place and she painted the pattern in black over white. After each section was complete, she would untape the stencil and reposition to finish the pattern on the wall. For more information on how to stencil, please check out our stencil tutorials. 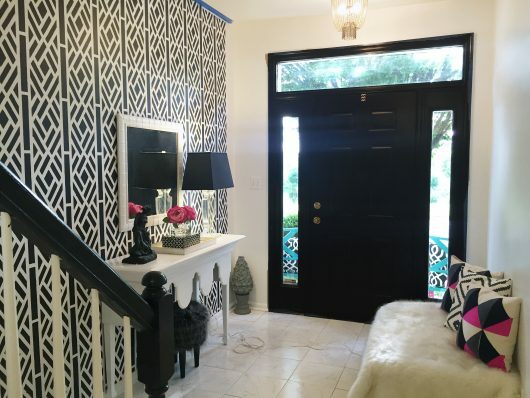 We love how stencils can easily add dramatic flair to this accent wall. Now Sallie can greet guests with some stenciled style! 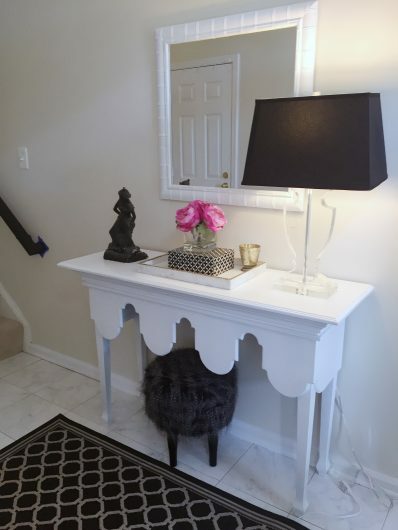 Tell us, what stencil pattern would you use to enhance your entryway? Leave us your thoughts in the comments below! An Enchanting Chevron Stenciled Bedroom!